The author selected the Diversity in Tech fund to receive a $200 donation as part of the Write for DOnations program. Prometheus is an open-source monitoring system that collects metrics from your services. Prometheus 2.0 brings many changes and improvements, such as a new time-series database, better resources usage, a new configuration format for alerts, and better Alertmanager discovery. In this tutorial you'll upgrade an existing Prometheus 1.x installation to Prometheus 2.0. The new time-series database in Prometheus 2.0, called tsdb, is incompatible with Prometheus 1.x, which means that you can't read the data from your Prometheus 1.x instance with Prometheus 2. To get around that limitation, you'll configure Prometheus 1.x to work as a read-only data store to make your old data available. Prometheus 2 uses a new format for alert rules, so you'll update your existing alert rules to the new format and work with Alertmanager. Finally, you'll use the web UI to make sure Prometheus is working as intended. This tutorial covers only the most important changes. Before upgrading to the latest version, you should read Announcing Prometheus 2.0 to make sure you're not affected by any of the other changes. One Ubuntu 16.04 server set up by following the Initial Server Setup with Ubuntu 16.04 tutorial, including a sudo non-root user and a firewall. 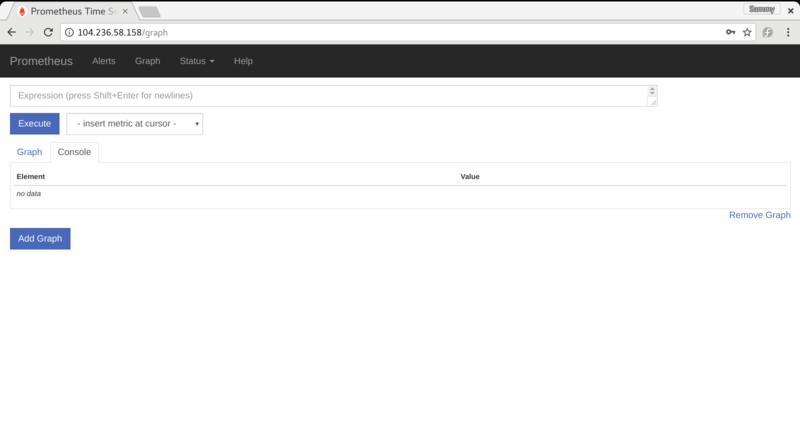 Prometheus 1.x installed on your server, including the Prometheus Web UI. You can find out your Prometheus version by running the prometheus -version command. The output contains your Prometheus version as well as build information. You have created a prometheus user. You have created the directory /etc/prometheus which holds Prometheus's configuration files. You have created the directory /var/lib/prometheus which holds Prometheus's data. The prometheus and promtool executables are located in /usr/local/bin. You have configured Prometheus to run as a systemd service called prometheus. In order to access your old data using Prometheus 2.0, you'll need to upgrade your current Prometheus installation to version 1.8.2 and then set up Prometheus 2.0 to read from the old one using the remote_read feature. Using the prometheus -version command, check out your current Prometheus version. The output contains the version and build information. If you're already running version 1.8.2 skip this step. To make sure you have a genuine non-corrupted archive, use the sha256sum command to generate a checksum for the archive and compare it against a sha256sums.txt file. If you don't see OK in the output, remove the downloaded archive and retrace the preceding steps to download it again. Copy the prometheus and promtool executables to the /usr/local/bin directory. Set the user and group ownership on the files to the prometheus user. Finally, start Prometheus to make sure it's working as intended. Lastly, check the service's status. If the service status isn't active, follow the on-screen logs and retrace the preceding steps to resolve the problem before continuing the tutorial. Verify the Prometheus version to make sure you're running version 1.8.2. If you don't see version 1.8.2 make sure you've downloaded the correct file and repeat the steps in this section. Lastly, remove the files you downloaded, as you no longer need them. Next, you'll reconfigure your existing installation so it doesn't interfere with Prometheus 2.0 once you install it. We want to keep Prometheus 1.8.2 around so we can access the old data, but we need to make sure that our old installation will not interfere with Prometheus 2 when we install it. To do so, we'll append 1 to the name of all Prometheus-related directories and executables. For example, the prometheus executable will become prometheus1. We'll also update the service definition and set it to run on a different port. Before continuing, stop Prometheus, so you can rename the files and directories. Prometheus has two associated directories: /etc/prometheus , for storing configuration files, and /var/lib/prometheus, for storing data. Rename these directories as well. We're going to run Prometheus 1.8.2 as a read-only data store, so we don't need it to collect any data from exporters. To ensure this, we'll remove all the content from the configuration file using the following truncate command. Before removing the file's contents, create a backup of the file, so you can use it later for configuring Prometheus 2.0. Then empty the configuration file's contents with truncate. Next, rename the service file from prometheus to prometheus1. Open the Prometheus service file in the text editor. Save the file and close your text editor. Reload systemd to apply the changes. To make sure it's working as intended, check the service's status. Enable the service to make sure it'll start when the system boots. At this point Prometheus 1.8.2 won't scrape any exporters. This will ensure data consistency once we set up Prometheus 2.0, which will use the current installation as a read-only data store for the old data. In the next step we're going to install Prometheus 2.0 and use Prometheus 1.8.2 to access our old data. In this step, we'll configure Prometheus 2.0 to scrape exporters and use Prometheus 1.8.2 as a read-only data store so we can access our existing data. Before continuing the tutorial, install Prometheus 2 by following Steps 1 and 2 of How To Install Prometheus on Ubuntu 16.04 tutorial. Once you have installed Prometheus, create a new configuration file. The configuration file format hasn't changed, so you can use your Prometheus 1.x configuration file with Prometheus 2. Copy the backup of your existing Prometheus configuration you created in the previous step into the /etc/prometheus/ directory. Set the user and group ownership on the newly-created configuration file to the prometheus user. The only change you'll make to this file is to tell Prometheus 2.0 to use Prometheus 1.8.2 as a read-only data store so you have access to the old data. Open the configuration file in the text editor. Before running Prometheus 2.0 for the first time, we'll update alert rules and configure Alertmanager to work with Prometheus. If you don't use alert rules or Alertmanager, skip the next step. Prometheus 1.x alert rules were defined using a custom syntax. As of version 2.0, you define alert rules using YAML. To make migration easier, Prometheus' promtool command can convert old rule files to the new format. If you don't use alert rules, you can skip this step. First, copy all the rules you have from the /etc/prometheus1 directory to the /etc/prometheus directory. The output contains promtool version and build information. If the version isn't 2.0, make sure you copied the promtool executable to the correct location. Now, navigate to the /etc/prometheus directory. This generates a new file called file-name.rules.yml file from a provided file. If you see any error message on the screen, follow the on-screen logs to resolve the problem before continuing the tutorial. Make sure the user and group ownership is set correctly on the files created by promtool. Lastly, update the Prometheus configuration file to use your newly-created rule files instead of the old ones. Open the configuration file in your editor. Now remove the old alert rule files as they're no longer needed. Next, let's configure Prometheus to discover Alertmanager. The -alertmanager.url flag doesn't exist anymore. Instead, Prometheus 2.0 introduced Alertmanager Service Discovery, which brings many new features and better integration with services such as Kubernetes. If you don't use Alertmanager, skip the rest of this step. Prometheus is now able to use the alert rules and communicate with Alertmanager, and we're ready to run it for the first time. To be able to run Prometheus 2.0 as a service, we need to create a service file. We can start with the service file we used for Prometheus 1.8.2, as it's mostly the same, other than the ExecStart command. Flags are now prefixed using double-dash (--) instead of single-dash. All -storage.local and -storage.remote flags have been removed and replaced with --storage.tsdb flags. The -alertmanager.url has been removed and replaced with Alertmanager Service Discovery, which is covered in the previous step. The --config.file directive instructs Prometheus to use the prometheus.yml file in the /etc/prometheus directory. Instead of --storage.local.path we'll use --storage.tsdb.path. Also, we have added two --web. flags, so we have access to the built-in Web templates. Lastly, reload systemd, so you can use the newly-created service. Check the service's status to make sure it's working as intended. 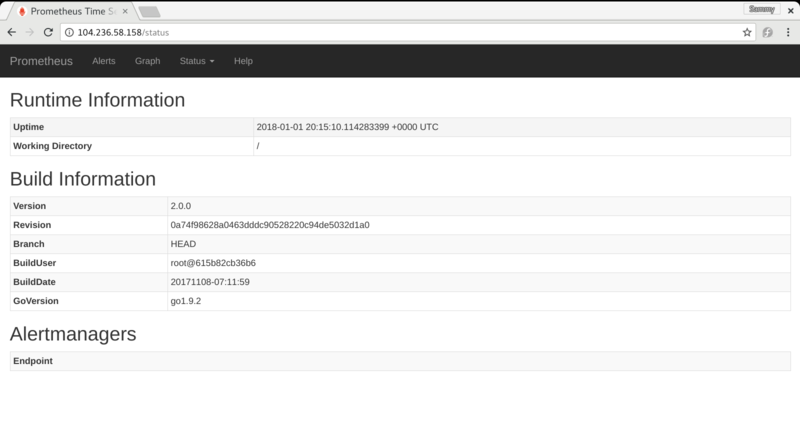 You can access the Prometheus' Web UI by navigating to http://your_server_ip in your web browser and authenticating using the credentials you configured when you installed Prometheus. You'll use the Web UI in the next step to make sure Prometheus is working as intended. Let's make sure that Prometheus 2 is scraping all exporters as intended, and ensure it can access the data from the previous installation of Prometheus. 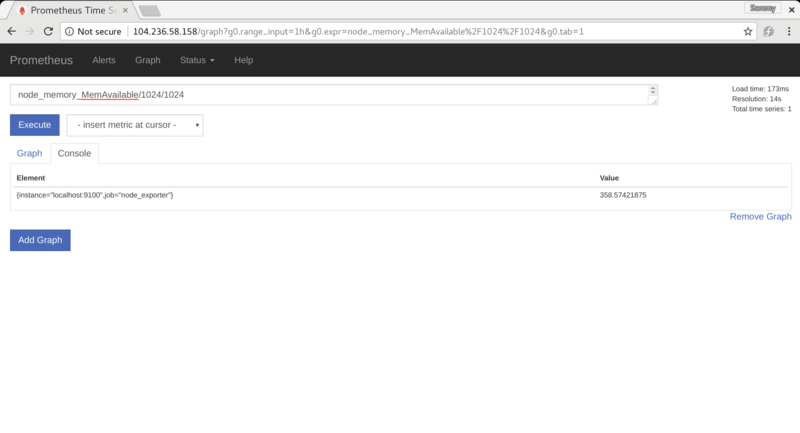 Navigate to http://your_server_ip in your web browser to access the Prometheus Web UI. You'll be asked to enter the user name and password you configured when you installed Prometheus originally. Before executing a query, let's check Prometheus' version and exporters status. 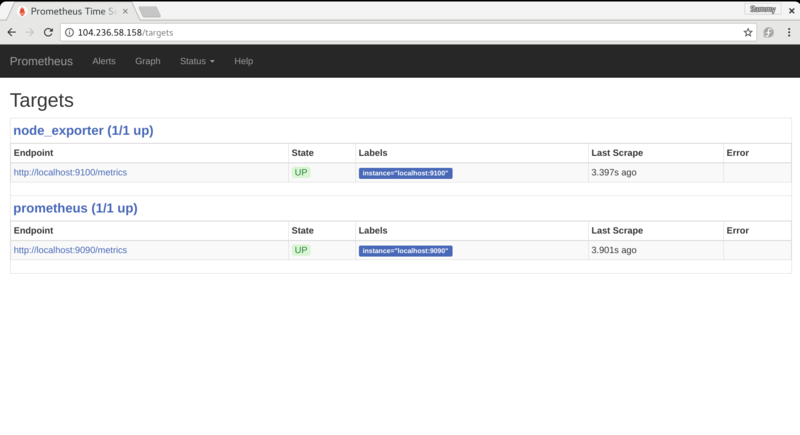 Click on the Status link in the navigation bar and click the Runtime & Build Information button. You'll see the page containing information about your Prometheus server. Next, click on the Status link again, then click the Targets button to check that your exporters are running as intended. The web page contains details about your exporters, including if they up and running. If you see any error, make sure to resolve it by following the on-screen instructions before continuing the tutorial. You won't see your Prometheus 1.8.2 data source, as it's used as a data store instead as an exporter. So let's ensure we can access both the old and new data. Click on the Graph button. In the Expression field, type node_memory_MemAvailable/1024/1024 to get your server's available memory in megabytes. Click on the Execute button. 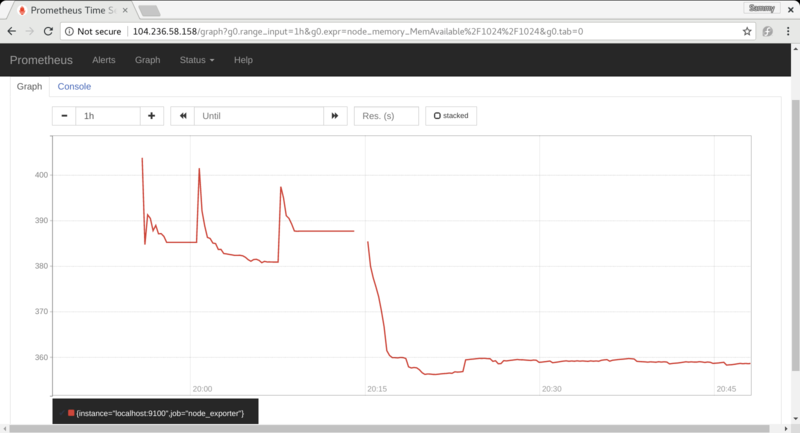 Click on the Graph tab to visualize available memory over time. On the graph, you should see the previous data, and after a break while Prometheus wasn't working, the latest data. If you don't see the old data, make sure Prometheus 1.8.2 is up by checking its service's status, and that you configured Prometheus 2.0 to use it as a remote database. You've verified that Prometheus is working and reporting data correctly. Now let's look at how you can remove Prometheus 1.8.2 and the old data once it isn't used anymore. You may want to remove Prometheus 1.8.2 and your old data once you don't need it anymore. Follow these steps to clean everything up. Warning: This is an irreversible operation! Once you delete your old data, you'll never be able to recover it unless you've backed it up. Save the file and close your text editor. Restart Prometheus to apply the changes. Next, disable and remove the prometheus1 service, and then clean up all the Prometheus 1.8.2 relevant directories and files. No output indicates that the operation completed successfully. Finally, remove the leftover files as they're no longer needed. First, remove the prometheus1 and promtool1 executables located in the /usr/local/bin directory. Then remove the /etc/prometheus1 and /var/lib/prometheus1 directories you used for storing data and configuration. Prometheus 1.8.2 is now removed from your system and your old data is gone. In this tutorial you upgraded Prometheus 1.x to Prometheus 2.0, updated all the rule files, and configured Prometheus to discover Alertmanager if it's present. Learn more about all the changes Prometheus 2.0 includes by reading the official Announcing Prometheus 2.0 post and the project's changelog.